Chiropractic Help, Issue #03 - How to stop falling. This month I have had to deal with a series of older folk who have taken a tumble. One in the kitchen, another in the bathroom (the most dangerous room in the house, except in the Netherlands where the staircase has that honour), and one on the street. Falls, when we get older, can be very destructive. A broken wrist or hip, a subluxated coccyx is this month's case, but also a fall on the knee causing a painful kneecap injury or a very bruised buttock. Mrs Jansen fell hard on her tailbone. Stepping out of the bath onto a wet tiled floor, she stumbled and fell onto the edge of the bath. Ouch! Getting an x-ray in Holland is well-nigh impossible. You have to be half dead, and fortunately it turned out not to be fractured anyway. She presented with a very beautiful purple buttock and an exquisitely tender coccyx. What can the older person start doing to prevent a fall? Or at least lessen the chance of a fall? Plenty. As we age all our neurological systems begin to weaken. Eyesight, hearing, taste, memory ... but, like everything else in the body, exercise of these systems has much benefit. So too our balance mechanism. Balance is maintained through three key systems. What is known as Proprioception. That is the awareness of movement in the body which is derived from muscles, tendons, and joints. Knowing where the various parts of the body are located in relation to each other, without the use of the eyes. The balance organ in the ear. These three systems, working in harmony, keep us on our feet. Research shows that elderly folk who regularly do some simple exercises to keep these systems functioning are much less likely to fall. Stand barefoot, comfortably, with one finger on the back of a chair. 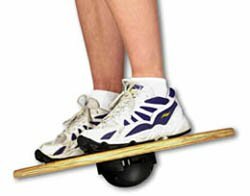 Now raise one foot a centimetre off the floor, and balance on the other foot. When you have your balance, raise your finger from the chair-back, up and down, in a regular motion gradually increasing the time off the chair. Try and stand for thirty seconds without touching the chair at all, if you can. Repeat with the other leg. Stand with your back in the corner of a wall for support. These are now getting more difficult because we are going to take the eyes out of the equation. With your feet slightly apart, and your arms stretched out in front of you, close your eyes and balance for perhaps twenty seconds. If it's too easy, place your feet together. If it's too difficult then cross your arms over your chest instead. Repeat turning your head first to one side, then the other. Repeat by moving one foot slightly forward. First with eyes open, and then closed. Again, turn your head from side to side, and even upwards (careful, this is much more tricky). Repeat with one foot in front of the other. Much more difficult, eh! Do these exercises several times a day, and you will find your balance improving. If all of this is ridiculously easy, then try walking toe-to-heel with your eyes closed. Are you handy with a bandsaw and a lathe, Grandpa? The wobble board below (can be purchased too, of course) would make a lovely inexpensive Christmas gift. Make different size balls to go under the board. With the best will in the world, most of us will fall occasionally. All women, men too really, should think about the causes of Osteoporosis long before they get old. By then it's too late to do much that is really effective. Right now the younger person can do plenty. An ounce of prevention ... for more info about brittle bone disease, click here. Cutting out all the fat in your diet (to lose weight) is not sensible. Certain fatty acids are what we call 'essential'. You can't live without out them. The nerves of the body, the brain and spinal cord, and our neurotransmitters are all dependent on essential fats, and cutting out all the fat in your diet will very quickly injure your nervous system. New research shows that persons suffering from Motor Neuron Disease have all been on low fat (and high simple carbohydrate) diets. But, because most of us have too much fat floating around in our blood streams, it is sensible to stick to the healthy fats. Cold pressed seed and fruit oils are best, particularly from the Olive and the Avocado. Fish, too. It's my opinion that we should avoid margarines which are 50% "trans-fat", an abnormal fat in all of nature, and not good stuff to build nerves cells with.